Embark on an unforgettable hut-to-hut hike around the highest mountain in western Europe, Mont Blanc. Cross borders at high passes with stunning views, enjoying local cuisine in France, Italy and Switzerland. Sleep in comfortable, traditional mountain huts, hiking with just a light pack each day. Leave the logistics to your local expert, and enjoy the trek of a lifetime. We begin the tour in Chamonix, a busy mountain mecca at 1000m of elevation. The Col du Bonhomme sits near the heart of the Reserve Naturel des Contamines-Montjoie. Dairy cows roam some meadows, their big traditional bells ringing over the alp. Ruins dot the landscape, though many ancient buildings are still in use. Each hut is unique and possessing of its own personality. The Rifugio Elisabetta welcomes us to Italy. Day 5 we treat ourselves to a sumptuous feast of vistas and meadows. The trails of the Tour are excellent and reasonably graded. Alpine villages work with the landscape in creative ways. Ibex abound throughout the tour, especially near the Col du Bonhomme and here at the Col Grand Ferret. Looking out on the Swiss Valais from the northeastern corner of the tour. Day 1: After landing in Geneva a short shuttle ride delivers us to Chamonix, a vibrant town set below the northern flanks of Mont Blanc. The afternoon is yours for exploration, and we’ll meet for an inaugural dinner that night. Day 2: We begin our circumambulation with a perfect warm-up, hiking the Grand Balcon with front-row seats looking out on the stunning spires and tortured glaciers of the Mont Blanc massif. We'll jaunt through meadows high above the busy streets of Chamonix, where we’ll return in the afternoon. Spending one more night in Chamonix makes it easier to tackle jet lag, grab any last-minute gear needs, and recover any delayed baggage. A hearty meal will be in order before we set out, and it’s a fine time to try fondue, raclette, or any of the other hearty Savoyard specialties. Day 3: Today we cross the valley and begin working toward its west side, working hard on the ascent to the Col du Tricot below the stunning icefalls of the Aiguille du Bionnassay. We may encounter shepherds and their sheep grazing the high alps, turning these low-growing herbaceous plants to cheese and wool. Then it’s down to les Contamines, a quiet village tucked into the verdant valley below, for dinner and much-deserved rest. Day 4: We set out up the gentle Roman road heading for the Col du Bonhomme as the broad contours of the mountain slowly take shape above. This was one of the main routes of the celebrated contrebandiers who transported goods across the high, unpopulated portions of the alpine borders all the way through the end of the second world war. By the time we reach our lodging down in Les Mottets we’ll be ready to eat illegal cheese, but will have to be a little more civilised and enjoy a fine meal at our gite. Day 5: Today we cross into Italy and begin our long north-eastward trek along the southern flank of the Mont Blanc Massif. Traveling through a gorgeous nature reserves, we may see ibex and chamois, the two hoofed denizens of these high valleys. We’ll pass through endless fields of alpine flowers and cross the only limestone outcrops of the entire journey. Finally, with the help of another Roman road, we’ll reach Courmayeur and the comfort of a friendly hotel–but also the impossible choice between pizza and pasta. Day 6: This layover day can be spent in a variety of ways. For those fond of heights, the trip up the spinning telepherique to the crest of the massif is worth the ticket price; while for others exploring the history of Courmayeur will be more inviting. 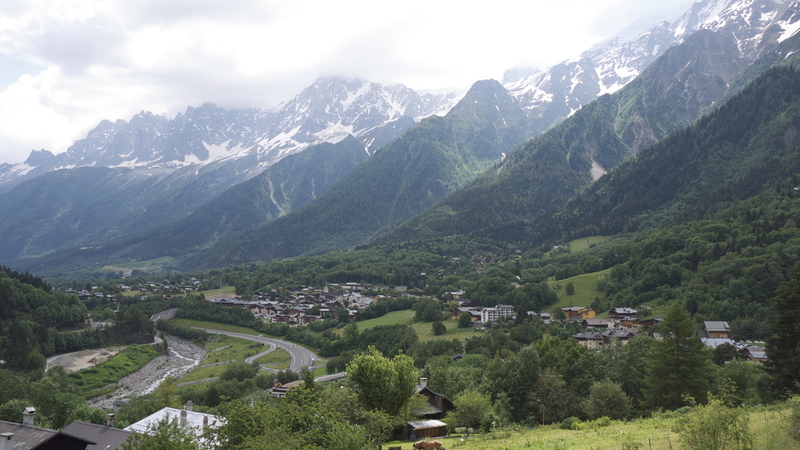 The valley of Aosta is as much French speaking as it is Italian, harking back to the days before modern states and their efforts for linguistic unity (the catholic priests here disobeyed Mussolini and taught French in secret during the second world war). If you don’t want a rest day, there is no shortage of stunning hikes to take near town. Day 7: This may well be your favourite part of the Tour (it’s certainly ours). Equal in majesty to the views from the Grand Balcon, the trail leaving Courmayeur gains and follows a perfect balcony of larch trees and flowering meadows. The endless secret cirques of the massif reveal themselves one by one, and the Himalayan scale of the Italian side will give you shivers. We’ll stay at the Bonatti refuge in order to savour this part of the route, and we can watch sunset on the high peaks from the front porch. Day 8: Today we complete the great horse shoe valley–le Val Ferret–formed by the pleistocene glacier that once gathered all the tributaries which today dribble off the sun drenched southern slopes of the range. We’ll hike up to the Grand Col Ferret and cross into Switzerland at a place where imaginary lines may well feel insignificant. A quick downhill leg brings us to our charming lodging in a working dairy farm. Day 9: Today we wrap around the east side of the mountain, connecting small hamlets where the Swiss locals still mow their hay from little terraces and herd their cows from field to field. With luck, my favourite ancient cherry tree will be covered in fruit, a perfect compliment to the cold water pouring from its traditional granite basin at a nameless spring. We’ll stroll easily on to Champex, a quiet village beside a glacial lake. Day 10: We’ll climb up into the high pastures above Martigny and cross to the Col de Forclaz, a strategic pass of great interest to both Napoleon and the Third Reich. Or, if you're feeling peppy, we can hike over the Fenetre d'Arpette, a stone's throw from the gorgeous Trient glacier. After a well-earned ice cream at the col (or slice of cheese in the case of the Fenetre), we’ll descend to the pink baroque church of Trient, our last Swiss stop on the Tour du Mont Blanc. Day 11: We close the loop today, at least in a hydrological sense, hiking across the border and down into the Chamonix valley. Depending on weather and appetites (for hiking and for food), we’ll choose an itinerary that puts the Aiguilles of Chamonix at centre stage, and which brings home the idea of the entire TMB–that these valleys are united ecologically, agriculturally, and culturally by the great mountain above. Day 12: Breakfasting on the final portion of our great circle (and on croissants), we’ll celebrate the tour with good food, drink and merrymaking in the very centre of the mountaineering universe. Day 13: It’s off to Geneva, and farewell to the alps. As tough as you want it to be. Check out the stats below to get an idea of the "purist's route," almost entirely on foot from start to finish. But for a reasonable fee, taxis can be used to cut some mileage out of the trip, especially in the lower valleys. If you're interested details, just get in touch. Day 1: Rest and wander.